We love soup in this family! Especially chowders. In a Dutch oven, cook the bacon over medium heat until crisp; remove with a slotted spoon to paper towels. Drain reserving 2 tablespoons drippings. In the drippings, saute the onion and celery until tender. Sprinkle with flour and stir until blended. Gradually add the cream. Stir in the potatoes, soup, parsley, Worcestershire sauce, seasoned salt and pepper. Bring to a boil; cook and stir for 1 minute. Reduce the heat; cover and simmer for 25 minutes, stirring occasionally. Add carrots and beans. Cover and simmer 15 minutes longer or until vegetables are tender. Stir in corn and reserved bacon; heat through. Dang, that looks so good. 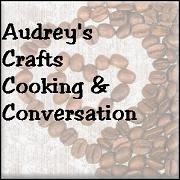 Thanks for sharing the recipe Audrey. How I start to knit my toys. Cast on with hook from middle.